While you can see wildlife all throughout Southeastern Massachusetts, your chances are much higher once you get outside of the big cities and get into the suburban and rural areas of the state. Did you know that there are moose in Massachusetts? Studies show that there are approximately one thousand of these animals living in the state, with the majority of them making their home in the eastern part of the state. Heavy duty truck towing is a valuable service for truck drivers who drive locally or pass through our state on their way to a destination. Local services that provide Brockton emergency response towing for trucks that have an incident with area wildlife and other types of complete towing services are essential. You can rely on Big Wheel Towing & Recovery in Freetown, MA for heavy duty towing and recovery in Brockton and the surrounding area. Whether you are driving the main highways or rural areas, picking up or delivering a load, it is quite common to see deer and other wildlife on the side of the road throughout the Southeastern Massachusetts area. For drivers who travel through the Brockton area, emergency response towing with a reliable company that has the equipment and training to handle big rig accidents, recovery, and towing, is very important. While there are no official statistics for Massachusetts, insurance agencies nationwide estimate that there are over 10,000 accidents that involve trucks and other vehicles with deer. Because they are closely monitored, state statistics do show that there are approximately 30 collisions each year that involve a moose. Any accident that involves a deer or a moose can result in significant damage to your truck and potential injuries to drivers. Nearly all animals involved in such a collision are either severely injured or killed on site. It can be a very costly situation for everyone involved, no matter how you look at it. 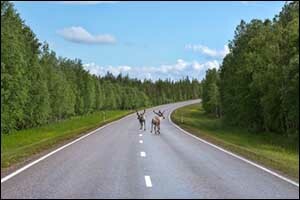 Wildlife awareness is perhaps the best defense for truck drivers and other motorists who travel these areas frequently. While there is no 100 percent foolproof product or method, the best way to avoid the cost associated with heavy duty truck towing after a collision with a wild deer or moose is to avoid getting into an accident in the first place. There are certain things that you can do to help reduce your risk of hitting an animal. Companies that specialize in towing and recover in Brockton and the surrounding area see many accidents that involve wildlife every day. Stay alert and keep your eyes open for wildlife that might gather or linger near the edges of the road. Sometimes seeing one can indicate that others are in the area as well, either for feeding, mating, or migration, depending on the season. Your headlights can be extremely helpful at night, helping you to see their eyes, even if you can’t make out a shape in the woods or dark shoulder. Animal behavior knowledge can also be beneficial, such as understanding that deer and moose are most active during the early hours of dawn and the evening hours at dusk. If you are traveling a rural or suburban road, you will be more likely to encounter wildlife than on a busy highway. However, they can be just about anywhere. Brockton emergency response towing is available to provide complete towing services and recovery in the Greater Boston area, servicing cities and towns throughout Southeastern Massachusetts, including Fall River, New Bedford, Dartmouth, and Attleboro. Wherever and whenever you need heavy duty truck towing and recovery services, Big Wheel Towing & Recovery can help. If you regularly drive through Massachusetts or work a route in the local area, you can count on Big Wheel Towing & Recovery for complete towing services throughout the region. Our yard is located in Freetown, MA. However, we provide heavy duty truck towing and recovery within a 50-mile radius of our location. So whether you need help with towing in Wareham or if you need Brockton emergency response towing in a remote location, give us a call at 1-508-763-5927. You never know when you are going to need professional towing and recovery in Brockton and the surrounding area, so it’s a good idea to keep our number handy. You don’t want to get stuck out in the middle of nowhere and have to rely on local services that may or may not have the equipment required to haul your big rig safely. Call today to learn more about our services or to speak with one of our team members.